A comprehensive handbook for beef cattle producers, this 152-page manual provides a wealth of useful information that is augmented by color photographs, charts and other illustrations. 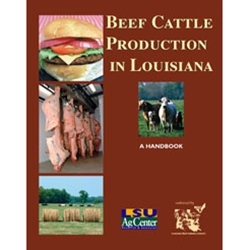 Written by several LSU AgCenter experts, it also includes contributions from other universities and organizations and was endorsed by the Louisiana Beef Industry Council. The handbook covers such topics as biology of the cow, body condition, selecting replacement heifers and bulls, beef cattle production technology, nutrition, quality assurance, vaccinations, management tips, pastures and forages, cattle handling facilities and much more.